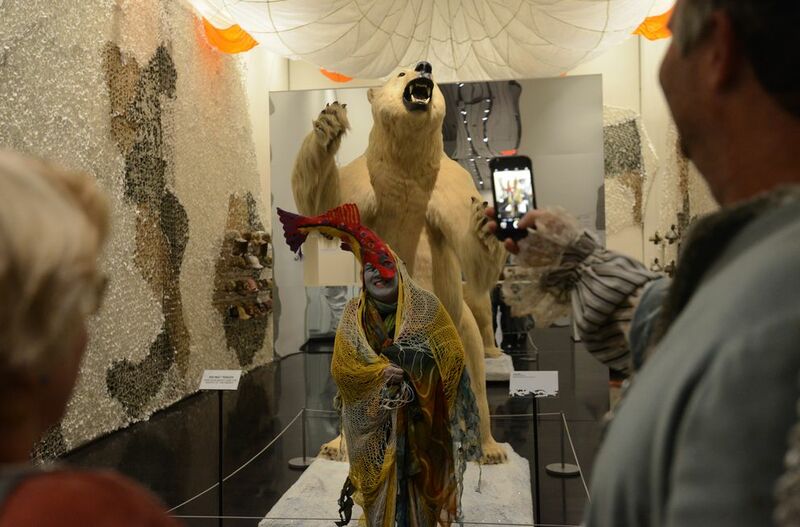 While most art exhibits focus on what you see, a new show at the Anchorage Museum is dedicated to what you don't see. "Camouflage: In Plain Sight," which opened to the public on Friday, explores visual illusion as practiced by hunters, soldiers, artists and butterflies. "We want to turn the idea of camouflage on its head," said the museum's deputy director and chief curator, Kirsten Anderson. One of the first things visitors see upon entering the multi-gallery exhibit on the third floor is a photo of cereal boxes lined up on grocery shelves. It takes a second glance to see artist Liu Bolin standing in front of the boxes, his face and clothing painted to match the background. One gallery looks at the way animals have evolved colors and patterns to blend in with their surroundings or resemble something undesirable, like a bitter meal or a predator. An aquarium contains cuttlefish, which shift their color to match the terrain. Cases hold beetles, butterflies, moths and walking sticks – the insects, not the ambulatory aids – that demonstrate both of these approaches to disguise. A third camouflage strategy is presented with a photo of zebras. The animal's stripes can make it hard to zero in on a single zebra when they move in a group. This approach, "distraction rather than concealment," Anderson called it, was the basis of an early camouflage technique that was widely used in World War I. Battleships were painted in stark and somewhat random patterns. They would have stuck out bobbing on the water, but the idea was that an enemy submariner would have a hard time calculating the speed, direction and even angle of a potential target. Whether it worked in war, the "razzle-dazzle" camo theme was a hit with designers in the 1920s and its influence is seen in art deco work. So many artists took to the style that Pablo Picasso thought he'd invented camouflage, Anderson said. He felt the military had borrowed the hard angles and bright colors of the cubists. Picasso's presumption is a wild exaggeration. Deception has been an integral part of warfare ever since people started fighting. For instance, tartan patterns that blended with the highland scenery were used by Scots in Roman times. The Chinese general Sun Tsu, writing 2,500 years ago, devoted a significant portion of his treatise "The Art of War" to the use of subterfuge. Modern tacticians are just as interested in how to put their enemy off-balance. The exhibit includes displays of camo patterns as they changed from World War II to the present. The displays include an inflatable tank, designed to trick spies into thinking a real fighting machine was present; a second one is located outside the museum and, if you're not expecting it, it's possible to confuse the painted balloon for a piece of real equipment at first glance. A series of particularly unsettling photos shows forest or alpine landscapes that seem uninhabited. But, we're told, an actual army sniper with weapon is located in each scene. Even with signs that tell you where to look, it's extremely difficult to spot the shooters. Hunting camouflage is another part of the exhibit, with emphasis on concealment in the snow. 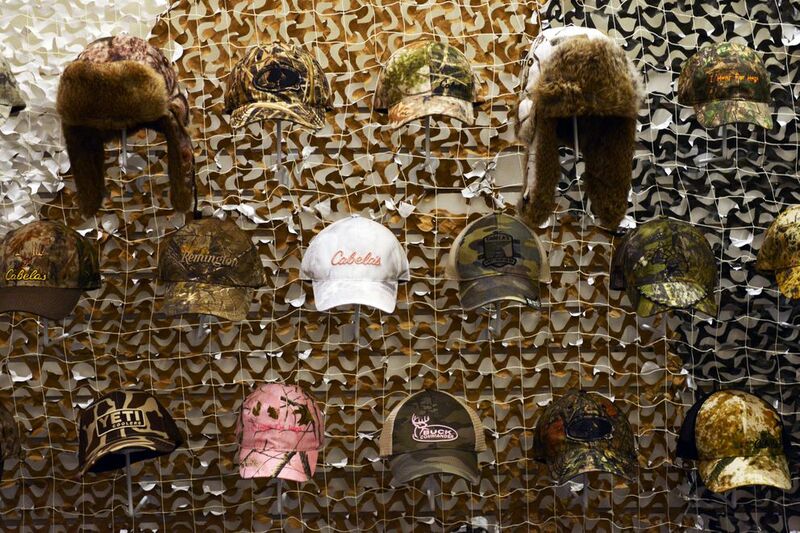 This part of the show includes a mounted polar bear, deer decoys, an Alutiiq hunting visor and a wall of hunters' hats that range from green or beige woodland motifs to the pink camo of recent vintage. A fun part of "Camouflage" is the gallery showing how patterns designed for deception and death made the leap to high fashion. Here you'll find an evening gown and dress suit and Manolo Blahnik pumps, all created to make a visual statement and draw eyes toward the wearer, the opposite of the classic reason for disguise. A number of jackets or vests in a variety of camo styles are available for visitors to try on and "take selfies," Anderson said. The place of camouflage imagery in popular culture is also featured, with rock and punk record jackets and references to pop art and op art. Andy Warhol's sprawling 1986 painting "Camouflage" is on loan from the Andy Warhol Museum in Pittsburgh, Pennsylvania, for this show. Also on loan is a "Soundsuit" by mixed-media artist Nick Cave, an assembly of sock monkey parts starting from the wearer's thighs and going some feet over his or her head. 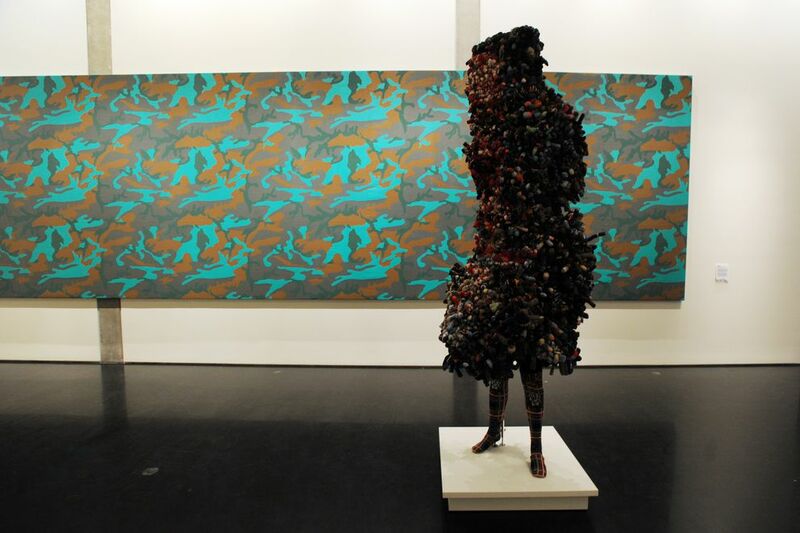 The idea of the "Soundsuit" is to "conceal identity to a neutral standpoint," said Anderson. The description asserts that it erases "race, gender and class, thereby forcing the viewer to look without judgment." (Though most viewers would probably form some sort of opinion about anyone who wore such a garment in public and the shapely mannequin legs used in the Anchorage Museum display strongly imply gender.) The piece takes its title from the fact that rattles are also part of the construction, though they are not heard in the display. 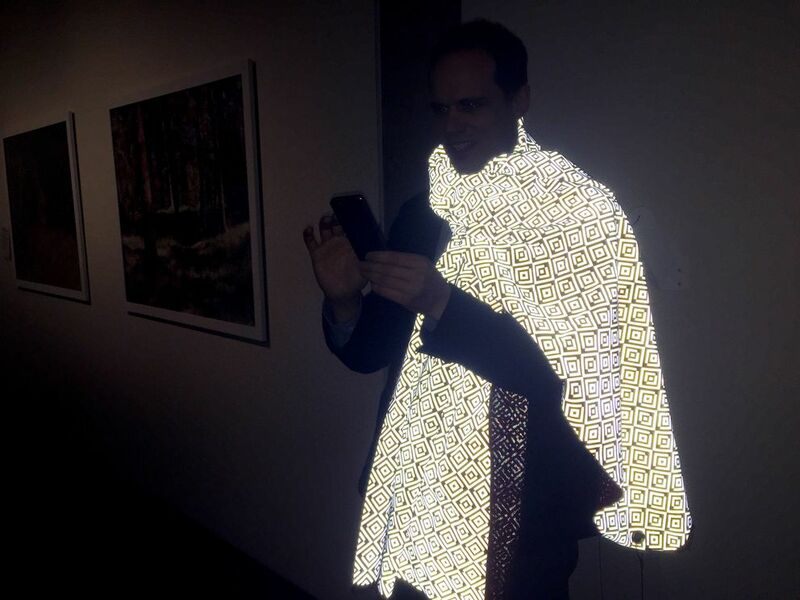 One final wearable item combines fashion and Star Trek technology, the "Cloaking Scarf" by Saif Siddiqui. "It's also called the paparazzi scarf," Anderson said. The highly reflective pattern on the weave is supposed to obscure the face of a celebrity when a camera flash is used. 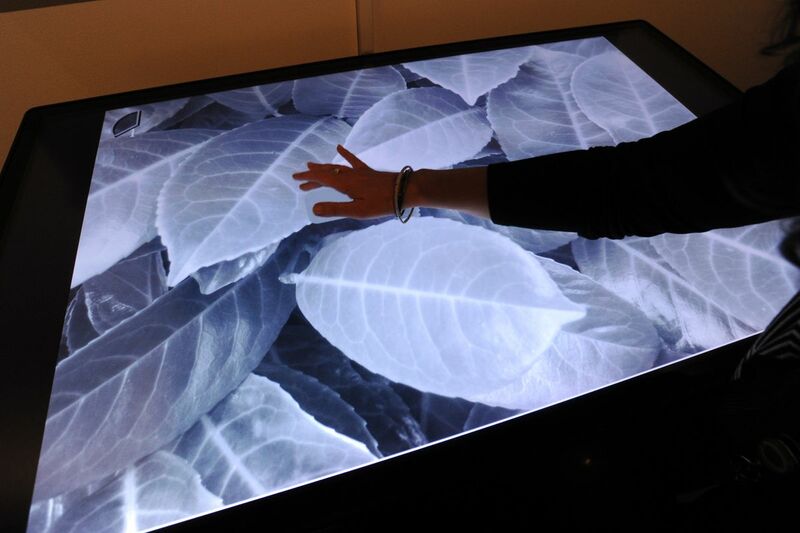 Visitors are invited to try it on and see what kind of pictures they get on their own camera. 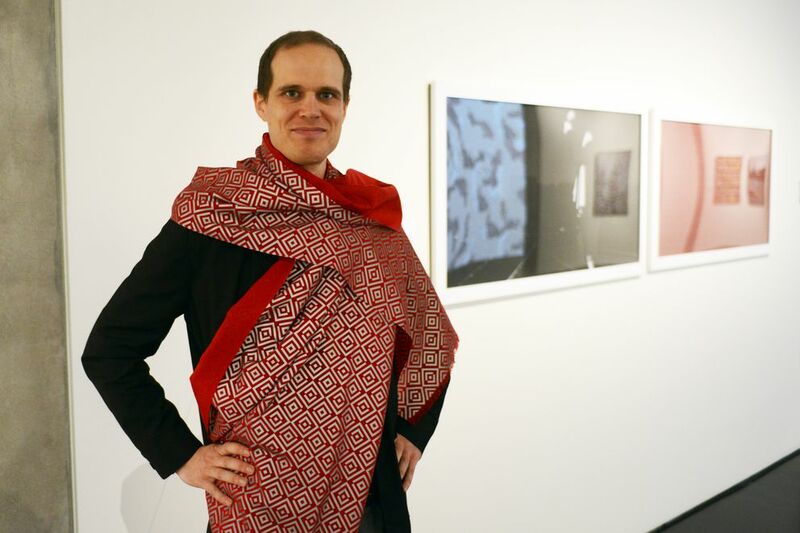 With the museum's public relations and digital engagement manager Thomas Gokey as a model, Alaska Dispatch News photographer Erik Hill tested the scarf's effectiveness. When he used a high-quality camera with a flash that can be adjusted, Gokey's face showed up just fine. But when a smartphone was used, the flash lit up the scarf and left his face obscured. The take-home message for would-be paparazzi: Don't use your cellphone to sneak a shot. 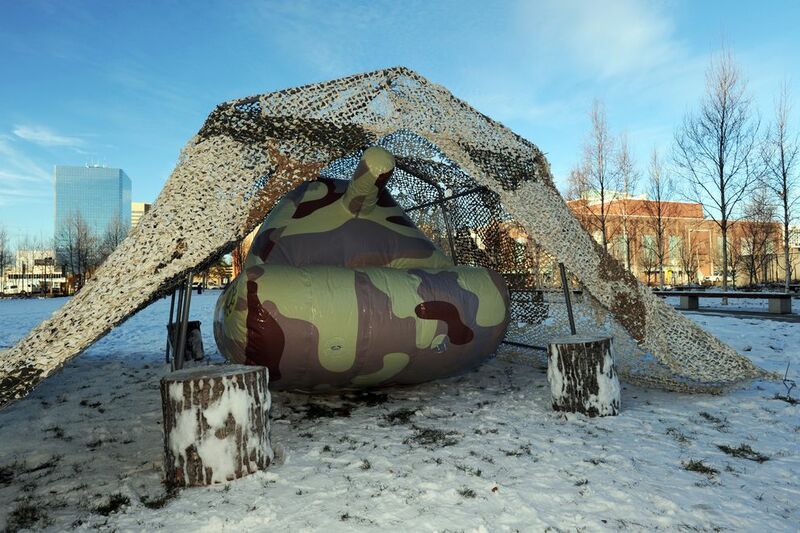 CAMOUFLAGE: IN PLAIN SIGHT will be on display at the Anchorage Museum through Feb. 5, 2017. 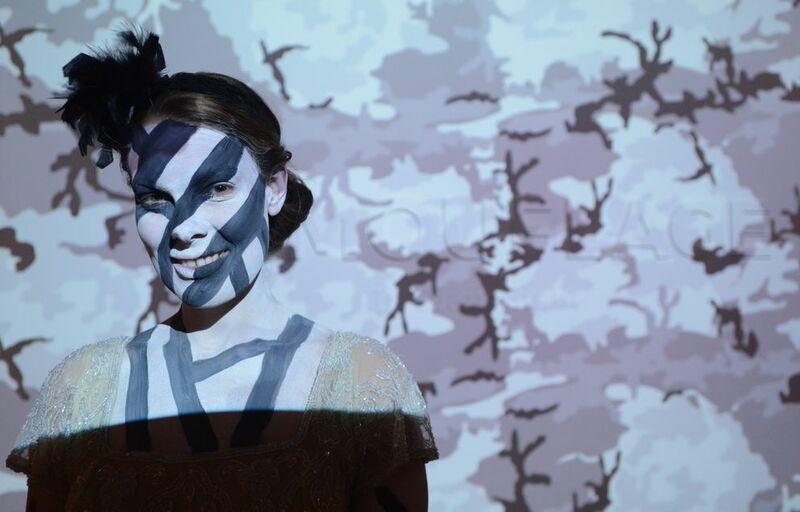 CAMOUFLAGE COSTUME PARTY will take place 8 p.m.-midnight on Friday at the Anchorage Museum, 625 C St. Tickets are $25, $20 for museum members. This is an age 21 and over event.